BUFFALO, N.Y. — Erik Karlsson broke up a goaltending duel between U.S. Olympic hopefuls Craig Anderson and Ryan Miller when he scored with 1:35 remaining in regulation to give the Ottawa Senators a season-opening 1-0 victory against the Buffalo Sabres on Friday night. Karlsson came down the right side of the slot and snapped home Clarke MacArthur’s feed from the left boards with 1:35 left in regulation for the only goal of the night. Anderson stopped 35 shots for his 23rd career shutout. Miller took a tough-luck loss despite stopping 45 of 46 shots. Miller’s goaltending led the United States to the silver medal in the 2010 Games at Winnipeg. He and Anderson, along with Jonathan Quick of the Los Angeles Kings, are among the top candidates to play for the U.S. at Sochi, Russia, in February. More than half of Miller’s saves came in the scoreless first period, when he stopped all 23 shots he faced. 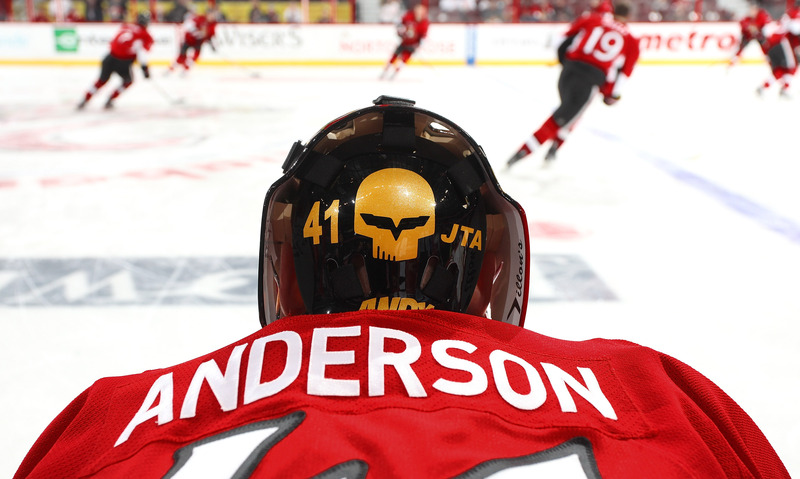 Anderson stopped 16 shots. The combined total of 39 shots without a goal through one period was the most in the expansion era, according to the Elias Sports Bureau. The volume of shots slowed in the second period, with Miller stopped 10 shots and Anderson making nine saves. Miller’s best save came late in the period he robbed Jason Spezza with his glove. That came shortly after Anderson went across the crease to deny Thomas Vanek on a 2-on-1 break. Anderson made several other fine stops on Vanek, who finished with nine shots on goal. Anderson was outstanding in 2012-13 but missed half the season with an ankle injury. He looked like he was in midseason form on Friday, and Spezza said wasn’t the least bit surprised. Anderson compared it to a pitcher’s duel in baseball. The game appeared headed for overtime until Karlsson, the Norris Trophy winner in 2011-12, beat Miller. Did Karlsson call for the puck? Miller’s brilliance didn’t matter to him. Sabres coach Ron Rolston was very displeased with his team and was especially critical of turnovers. He pointed towards the line of Brian Flynn, Kevin Porter, and Zemgus Girgensons as Buffalo’s best of the night. Vanek saw things a little differently. Ottawa continues its season-opening six-game road trip with a visit to the Toronto Maple Leafs on Saturday night. The Sabres, now 0-2-0, visit the Pittsburgh Penguins on Saturday.